Spinous process is a bony protrusion at the posterior of each vertebra. The spinous process protrudes at the point where the laminae of the vertebral arch combines and gives the point of connection for muscles as well as ligaments of the spine. 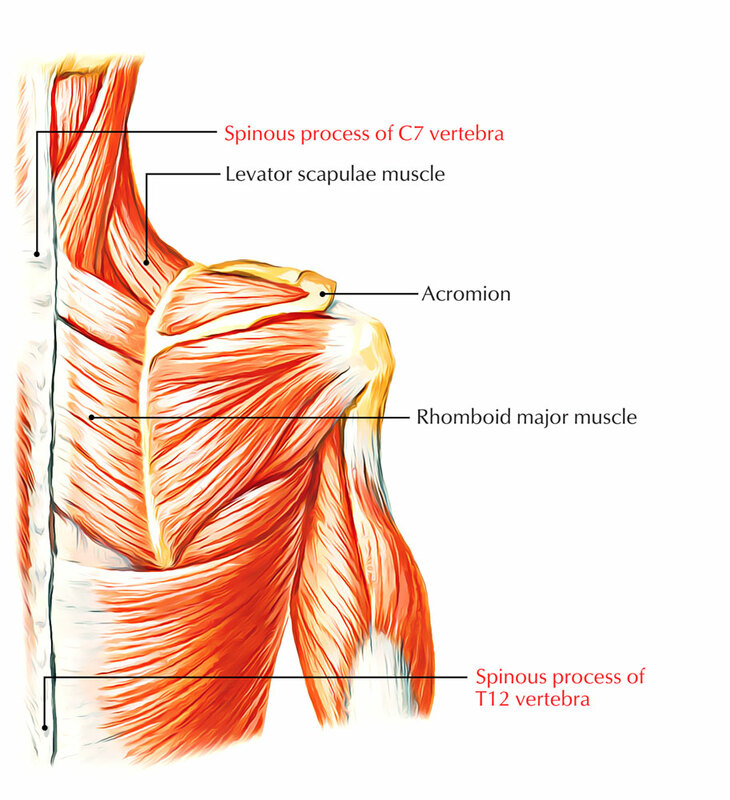 Spinous processes are the rims that along the back of the spine can be felt through the skin. In the neck, the spinous process to fracture can appear in cases of abrupt torsion such as whiplash. Normally, the fracture known as a “clay shoveler’s fracture” arises in the upper spine at C6, C7 or T1. Through deep palpation in the midline inferior towards the skull as the most superior bony protrusion the spinous process of vertebra CII can be recognized. With the exception of vertebra CVII, most of the other spinous processes are not freely palpable due to the reason that they are covered by soft tissue. Specifically when the neck is flexed, the spinous process of CVII is usually detectable as a prominence in the midline at the base of the neck. Ligamentum nuchae extends in the middle of CVII and the external occipital protuberance of the skull, which is readily perceptible as a longitudinal ridge when the neck is flexed. Inferior towards the spinous process of CVII is the spinous process of TI, which is more prominent than the spinous process of CVII. The root of the spine of the scapula and the spinous process of vertebra TII are located on same plane, and the inferior angle of the scapula is located at equivalent plane to spinous process of vertebra TVII. In the middle of the inferior angle of the scapula and the iliac crest, the spinous process of vertebra TXII is equivalent to the midpoint of a vertical line. On each side, a horizontal line in the middle of the highest point of the iliac crest goes across via the spinous process of vertebra LIV. The LIII and LV vertebral spinous processes can be palpated, individually above and below the LIV spinous process. The sacral dimples indicate the positions of the posterior superior iliac spine are equivalent to the SII vertebral spinous process. 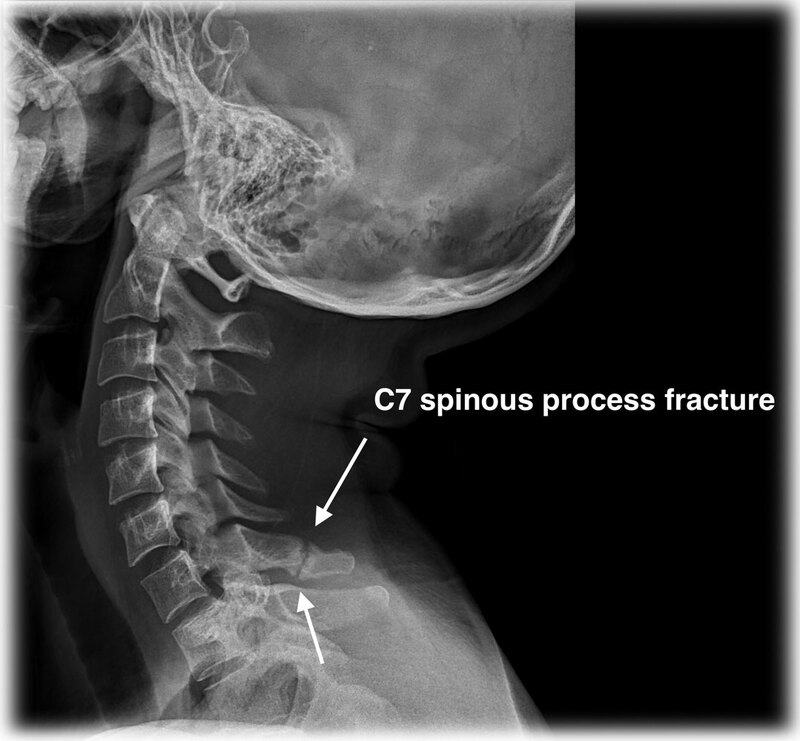 Clay-shoveler’s fracture can occur at any of the lower cervical or upper thoracic vertebrae, naturally at C6 or C7, it is mainly a stable fracture across the spinous process of a vertebra. In Australia during the 1930s, men that dug deep ditches had to throw clay using long handled shovels 10 to 15 feet directly above their heads. Rather than breaking away, the sticky clay would every now and then stick to the shovel; the worker would hear sound of a “pop” and feel a sharp pain in the middle of the shoulder blades, not capable to carry on the work. The mechanism of injury is considered as derivative of muscle pull and reflex with force relayed via the supraspinous ligaments. An avulsion fracture is produced by the immense force pulls on the spinous process. Plain film examination can reveal the fracture.